Robbie Harms is an online and at-home tutor for the SAT and ACT. A recent graduate of the University of North Carolina at Chapel Hill, who is currently working toward a Masters in Education at the University of Florida, Robbie also offers college consulting and specializes in editing college application essays. 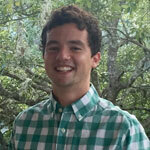 He is a former reporting intern for The New York Times and The Boston Globe and has strong writing and editing skills. Robbie is still searching for the rollie pollies that Mr. Platt requested for a science project five years ago. Robbie offers online and at-home SAT, ACT, and PSAT tutoring for individuals and small groups. He also offers college consulting, edits application essays, and provides general subject-specific tutoring, especially writing help.